One food misconception I hear all the time is that eating healthy means sacrificing the foods you love most. For example, a bunch of my friends don't like to let their kids have snacks like cake or cupcakes for all the obvious reasons and so the kids have to miss out on fun things like chocolate cupcakes at birthday parties. I can't think of many things more heartbreaking than seeing a little one at a party having to eat a banana while all the other kids' faces are covered in chocolate frosting. Well, here at weelicious, we're always up for a challenge. Is there a healthy cupcake with absolutely no refined sugar that parents can be happy to serve their kids and even the most discriminating chocoholic will love? Well, after testing these cupcake and ganache ( a fancy word for icing) recipes over a dozen times this past week, I can confidently say the answer is yes! Not only is this recipe delicious, it's also the easiest version we tried. All you have to do is dump the ingredients into the mixer, stir, pour and bake! And by using agave instead of sugar, you sacrifice none of the flavor of traditional chocolate cupcakes. Another bonus? You can even make them vegan by using oil instead of butter and rice, almond or soy milk instead of cow's milk. Either way, what you get is a light, perfectly sweet chocolate cupcake that every kid will love. I took a whole batch over to Kenya's sports group on Monday and they disappeared in minutes and even the most health conscious moms were happy! 2. Place ingredients in a mixer or mixing bowl in the order listed and mix well to combine. Batter should be free of lumps. (No need to sift the dry ingredients or place in separate bowls. This is a dump in the bowl, mix and bake recipe). 3. Fill greased or line muffin cups with batter about 3/4 full. 5. Bake for 20-22 minutes for regular sized and 15 minutes for mini cupcakes. 1. Heat the cream and agave in a small saucepan just to a boil, whisking to combine. 2. Turn off the heat and add the chocolate. Whisk constantly until chocolate is melted. 3. Pour into a bowl and add the butter 1 tablespoon at a time until icing is smooth and butter is incorporated. Thank you for such a superb recipe! I'm eager to try the ganache at our daughter's next birthday party. LOVE,LOVE,LOVE these!!!! Super easy and yummy! Everything you post is amazing! We love it all. Do you have a vanilla version of these cupcakes? My daughter's birthday is coming up as well, and I would like to offer a variety. Hi, this looks fantastic! But i was wondering, if i use honey instead of agave (because i have to order agave online but honey i can buy in the store and i wanna try this out before my sons birthday (in 3.5 months lol so i have time!)) would i just use the same amount of honey as the recipe calls for agave? Just made these again for the third time! They are so moist and delicious! I substituted 1/4 cup oil + 1/4 cup apple sauce for the butter. how many percent fat does heavy cream has got? Is the Cocoa powder sweet or unsweetened? I need to make these on Friday, if you could send a quick response. Thank you! advertising and *********** with Adwords. Anyway I am adding this RSS to my e-mail and can look out for a lot extra of your respective interesting content. Ensure that you update this again soon..
absolutly love this recipe! (and all the other weelicious ones) its not super sweet which is great for my 1 year olds first cake and it is super easy to make not weird ingredients or time consuming details. thanks for another go to recipe! Hello. I would like to make these, but I need to know if they will hold up if shipped by mail. I have to and these to Florida and Colorado. Also, is it okay to use regular mail, or should I go to a mail shipping store? Can these be sent through the mail? Do you suggest over night? Is it better to use a shipping store, rather than the US Postal Services? Is it correct for me to assume that the Cocoa Powder is unsweetened and the vinegar is white vinegar? Thank you! Yes, I always use unsweetened cocoa powder so I sometimes forget to specify! Yes, white vinegar! Oy, sometimes this mommy's brain gets a little scrambled! If I wanted to make this a cake what size pan would I use? And long would you bake it. I live in Colorado so at high altitude? Is it possible to substitute the ap flour for whole wheat flour? I would actually love to use coconut flour but I know the consistency is different. So looking forward to making these!! The icing will hold to the cake pop, but you would probably have to let it dry. Why does it call for vinegar? I am just curious since I\"ve never seen it with other cupcake recipes. Since this recipe has no eggs the baking soda and vinegar work together to leaven and bind the cake! I just made these and they taste like glue... I'm a former vegan baker so I know what I'm doing... what do you think happened?! Without being there I can't know for sure what happened. How did you measure your ingredients? You may have used too much flour or not enough liquid. I scoop the flour into the measuring cups with a spoon and then level with the flat side of a knife. If you pack your flour in the cups or scoop directly from the container you would end up with more flour than I used. What type of flour did you use? Nettle leaf, not nettle root. Nettle root is good for psattore problems but not so much for what most people want out of nettle. Nettle leaf is one of the herbs that almost anyone can take at any time. I've never heard of a recommendation to only use it for a limited time. I know Susun Weed recommends it daily for all seasons of life. It's gentle, supporting the liver and kidneys, full of nutrients. I drink an infusion of it almost daily and can the difference (low energy) when I stop for a while. 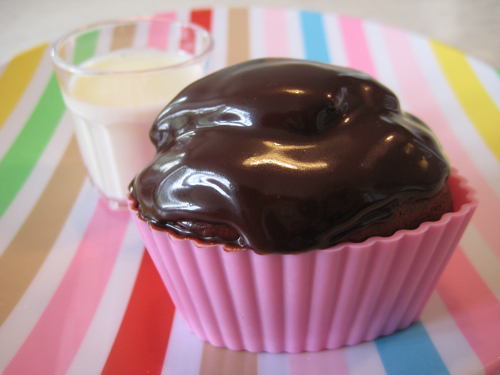 Question about the icing: can I use cocoa powder instead of shaved chocolate? If so, how much would you recommend? Loved the Ganache but I may have done it incorrectly because I had only used 2 TBsp of butter and it was a lil runny. It was still awesome, specially for my chocolate loving husband : ) Also, I made a cake instead of cupcakes. The mix was a bit thick and I kept using milk. It tasted great! I tripled this recipe and made it into a multi-layer cake for my son's second birthday. It made one rectangular casserole pan, one 9 by 9 square pan, and a few cupcakes. I stacked them all together and topped it with cream cheese`cocoa icing, and then decorated it with a mini loader, digger, dumptruck, chocoalte rocks, and black sanding sugar to make it look like a construction site. The cake recipe was perfect! It was thick, which made a firm cake, perfect for this kind of decorating. It was so easy to make, too. This is definitely a recipe I'm going to come back to over the years. I noticed there are few different Agave products at our local Whole Foods; light, dark, raw, etc. What kind do you use in your recipes? I use light! You can use dark, but it might change the color of the dish! Thank you for the great recipe! I used maple syrup (I'm Canadian!) instead of agave &amp; they were fabulous. And so easy to make! will the icing hold up for several hours? Trying to cut back on refined sugar in our house. I'm gonna make these for my son's 2nd birthday! Thanks so much for the awesome recipe! As a side thought...have you really seen someone give their child a banana while others were eating cupcakes? I hope you were joking. I mean unless they have a dietary restriction, this is just sad. Absolutely delicious! I have made these cupcakes three times now but tonight, I poured the ganache frosting into a piping bag and inserted the tip into the center (from the top) of the cupcake, squeezing the filling inside and then over the cupcake as I always have a lot of frosting left over. It's a little messy but totally worth it! My 4-year old son absolutely loves these cupcakes! These were delicious! Thanks so much for the recipe! What's the measurement for the Greek yogurt? I just see <br> written in front of the Greek yogurt and does it belong in the cake or the icing? I'm wondering the same as the amount of yogurt is listed as <br>, please clarify. Thank you. Is there greek yogurt/chocolate ganache greek yogurt in the cupcakes? The recipe is written weirdly at that point. Basically, do the cupcake ingredients end at the vinegar?